Having your own pool is fantastic. You can enjoy yourself whenever you want, and spend quality time with friends and family. However, as a pool owner, you certainly know that it comes with certain responsibilities too. If you want it to remain pleasant to use, you will have to spend some time cleaning and maintaining it. Sure, water circulates and goes through the filters, but some amount of dirt, debris and leaves remains in the pool and requires your attention. One significant piece of equipment you will need is the pool vacuum hose, among other things. You will often receive a hose with your pool setup, but it may not be very good, or time has come to replace it. Many different hoses are available on the market, and not all of them offer the same level of quality and reliability. Finding the best pool vacuum hose is a matter of knowing what to look for. This is why we created a buying guide to point out some things you should pay attention to when selecting a hose. Furthermore, you can be sure you’ll find a good solution among the products we selected (regardless of which type of pool you have), so don’t miss out. We begin with a great hose from Poolmaster that is made from flexible EVA and has poly-welded cuffs. In addition, the cuff that connects to the vacuum head swivels, allowing you better maneuverability. The hose features spiral-wound construction, so you don’t have to worry about kinks or tangling. Furthermore, it’s UV and chemical resistant, meaning it will last longer than many other products. You don’t have to worry about crushing or ruptures either. 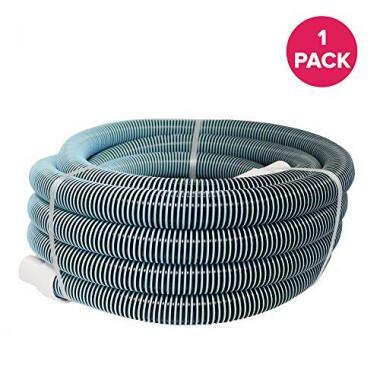 It’s really one of the best swimming pool vacuum hoses you can get in terms of value for money, and you can even choose the length that suits you best. 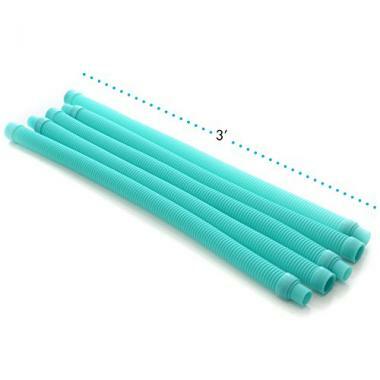 This top rated swimming pool vacuum hose comes in 5 pieces. Each piece is 3ft long, and you are free to combine them depending on the length you need when cleaning. The hose is compatible with most automatic pool cleaners, and it works well for both in-ground and above ground pools. Materials used are great, allowing solid flexibility while remaining durable. Because it comes in parts, it’s even easier to store than conventional hoses. Intex brings us a hose that is very thick and strong. It’s compatible with all Intex filtration systems, and many other skimmers thanks to the 1.5-inch cuff diameter. Even though it doesn’t swivel, it’s very lightweight and flexible allowing you comfortable user experience. It’s long, but you have the option of cutting it and then reattaching the nozzle. It’s the most budget-friendly product featured in our pool vacuum hose reviews, which is certainly a bonus. U.S. Pool Supply designed this hose to be truly heavy-duty. It’s very firm, made of tough EVA material and offers more than enough length. In addition, it has swivel cuffs to prevent twists and kinks which can compromise efficiency. It’s really built to last, and you get a 5-year warranty with it. All things considered, these pool vacuum hoses are definitely worth giving a try. A great thing about this one is that you can choose both the length and the diameter while being certain you’re getting a top-notch product. It’s spiral wound, won’t collapse under load, and offers exceptional strength. It’s made of heavy-duty plastic which is crush and leak-proof, and also UV resistant. As a plus, the walls inside are smooth which greatly improves the flow. Many happy customers are using this hose, and if something goes wrong you have a 3-year warranty to cover you. Think Crucial offers a heavy-duty hose as a superb replacement for almost any type of hose you need changing. The length is sufficient for most pools, allowing you to easily vacuum even the deep end. The material used is very strong, and the convenient design allows you to wind it any way you want. 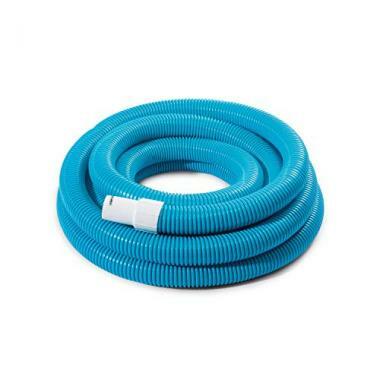 Furthermore, this pool cleaner hose is easy to wash and maintain, so you can expect it to last for a really long time. This above ground pool vacuum hose is somewhat lighter compared to others. But don’t let this fool you – Haviland is a reliable manufacturer so you can count on it to work well. It’s an efficient hose that has smaller dimensions to make it more convenient. As for qualities, it’s abrasion resistant and comes with protection against UV and chlorine. The flow is excellent thanks to the smooth inside walls, and the whole hose is very rugged. It’s an excellent choice when cleaning your above ground pool, and you get a 3-year warranty as an added bonus. This is probably the strongest hose you’ll be able to find. It’s very popular among professionals for many good reasons. It’s made of premium materials, completely protected from weather and chemicals and allows strong and consistent flow. The hose swivels, and never kinks or tangles regardless of position. Perhaps the biggest plus is the durability – it shows no signs of deterioration even after years of heavy use. 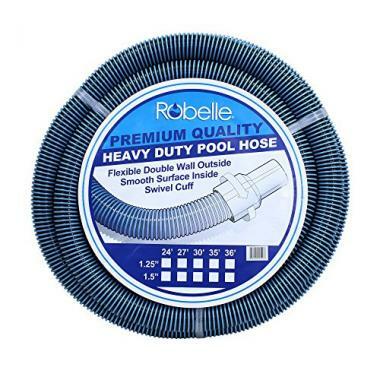 It’s one of the best pool vacuum hoses overall if you’re willing to invest a bit more money. Finally, it offers the largest choice of lengths and diameters, so you can definitely find the right one for you. As we mentioned in the beginning, you need a reliable hose that gets the job done. This means it needs to be made from strong materials, needs to have sufficient length to reach every part of your pool, and should preferably be affordable. It’s a type of pool cleaner that allows you to remove all the debris from the bottom of your pool. You need to think about different features that can be found on a hose, and we are going to help you. 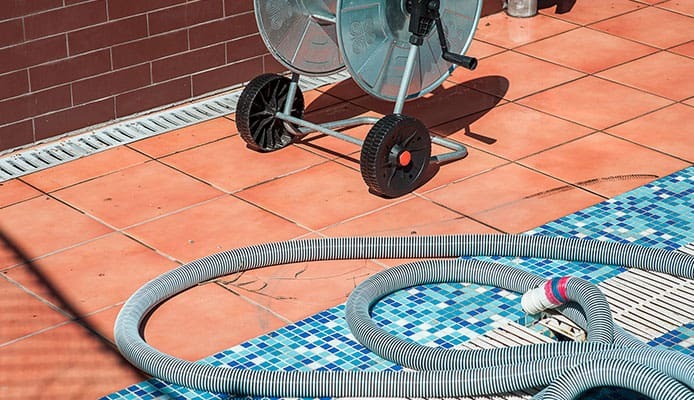 Keep in mind that a bad pool hose can be the one causing problems when cleaning, even though you may not suspect it. 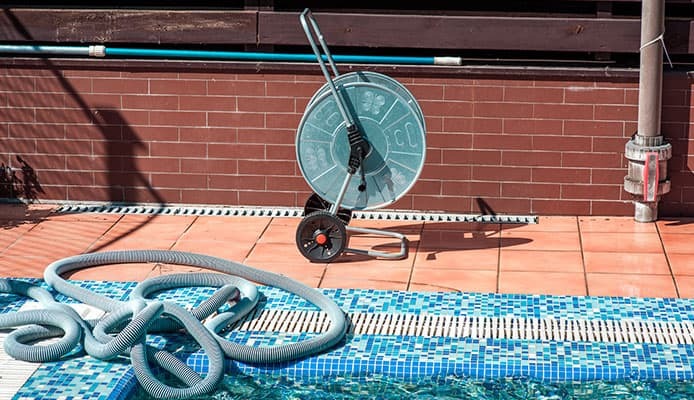 Great pool hoses can be found for a decent amount of money, so you should consider buying a top-notch product and add vacuuming to your pool maintenance schedule. A good hose is usually made of high-quality EVA plastic or a similar material. It offers strength and flexibility, without being prone to leaks. You should avoid cheap and thin plastic because it won’t work well (it will rupture quickly). 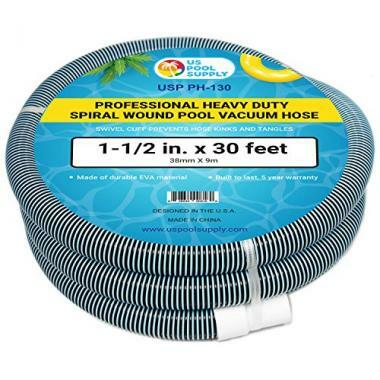 Some of the best swimming pool vacuum hoses have a polymer outer layer, which gives them additional protection against UV rays and chemicals found in pool water and increases their durability. A good indicator of hose quality can be the warranty you get with it, and some products have up to five years. 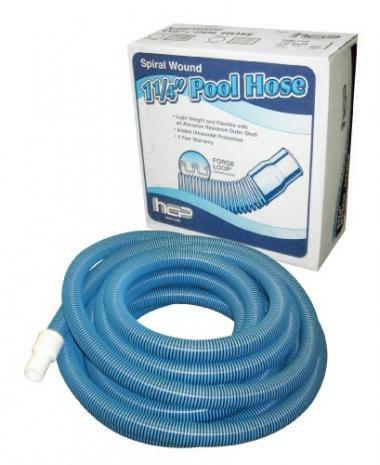 Sufficient length of the pool cleaning hose allows you to reach every part of your pool. If you have an average-size home pool, a 30ft hose should be more than enough. However, we suggest you do some measuring before you order, and always buy a bit longer than you think you need (for comfortable use). As you had the chance to see, some hoses come in pieces. You can add or remove parts based on what you need at the moment. An added benefit of this type of hose is that it’s easier to clean. In addition, you should consider getting a manual pool skimmer too, because it can be handy in some situations and make cleaning even quicker. This determines the efficiency of the hose. It’s generally accepted that larger diameters are better, especially if you have a large pool and a stronger pool pump. Most products we listed have a 1.5-inch diameter, which is usually more than enough to give a good flow. An added benefit of wider hoses is that they are easier to clean, and have a smaller chance of getting clogged up with the debris that passes through. While discussing this, you should think about cuff diameter too. It should be able to fit on the vacuum head and skimmer, and sometimes you will need to use a vacuum plate to connect it properly and get good suction. Flexibility is important so you can move around freely without having to worry about the hose kinking or rupturing. Materials determine the flexibility, but they are not the only factor – it has to do with the design too. 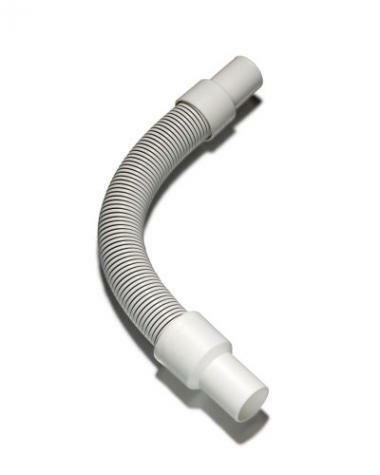 Spiral-wound hoses are great in this aspect, allowing easier movement while at the same time making the hose stronger. It’s a big plus if the hose comes with swivel cuffs that connect to the pool vacuum head. When hooked up, the hose swivels around the attaching point which greatly reduces the chance of twisting or stopping the flow. If the hose kinks or ruptures, it loses its efficiency and nothing reaches your pool filter. Based on this, the importance of getting a flexible hose is obvious. 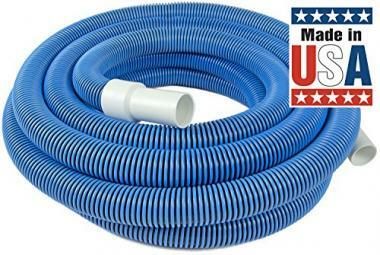 Q: What Are The Benefits Of Swimming Pool Vacuum Hoses? A: A swimming pool hose is necessary to keep your pool clean, and investing in a top product can be very beneficial. Together with the pool pump, skimmer, vacuum head, and the telescopic pole, it forms a system which removes all the debris from your pool. A well-made hose will be easy to use, durable and allow you to easily remove sand from your pool or get rid of water bugs, so the water is clean the next time you want to take a dip. 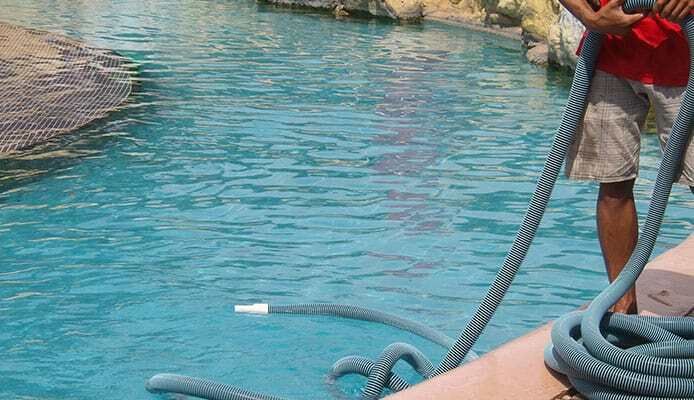 Q: How To Clean A Pool Vacuum Hose? A: If you want your hose to work well and last, you need to clean and maintain it. Be sure to flush it every now and then, to make sure nothing is stuck inside. It’s a big plus if the hose has a smooth inside surface because this makes it easier to clean. In addition, you need to think about storage too – hoses are not meant to be left lying on the ground. You shouldn’t leave them in the pool either, because if you’re familiar with basic pool chemistry you know that prolonged exposure to chlorine can cause damage. Even though some hoses have special protective layers, you should still pack and store them in a shed or garage. Getting a reliable hose will make pool cleaning quicker and more efficient. If you get the right product, you’ll be able to use it for years, so it’s really worth it. You just need to find the one that is suitable for your pool in terms of length, diameter and added features, and you can get started. Of course, you can make things even easier for yourself if you buy a pool cover too. There are many good reasons to cover your pool, one of which is preventing dirt from getting inside so you have fewer things to vacuum later. We hope our article helped you in making a decision regarding a new hose, so you can spend less time cleaning and more time enjoying yourself! Have you tried a pool vacuum hose that made it onto our list? How are you satisfied with the quality? What about length and efficiency? Please share your experience with us in the comment section below.